Many speech-language pathologists have expressed uncertainty about the best way to help school-age children who stutter overcome their speaking difficulties. Common questions include: which children need treatment and which are likely to “outgrow” stuttering, what treatment methods are most appropriate for young children who stutter, how to incorporate parents in treatment and what to do if parents are not involved, and what to do if treatment is not “work­ing.” Dr. Yaruss has developed a two-part series to help clinicians find real-world, practical answers to these and many other questions. 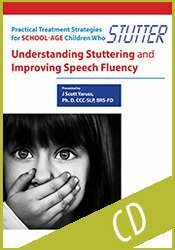 The purpose of this course is to provide clinicians with an overview of the stuttering disorder in school-age children and to review strategies for helping improve their speech fluency through changes to the timing and tension involved in speech production. In this live, interactive webinar, participants will discuss specific exercises and strategies and will explore a variety of ways to help children who stutter overcome the difficulties associated with their stuttering. Participants will come away from this program feeling more confident in their own abilities for helping children who stutter and be better able to respond to the challenges of stuttering therapy in schools and other settings.